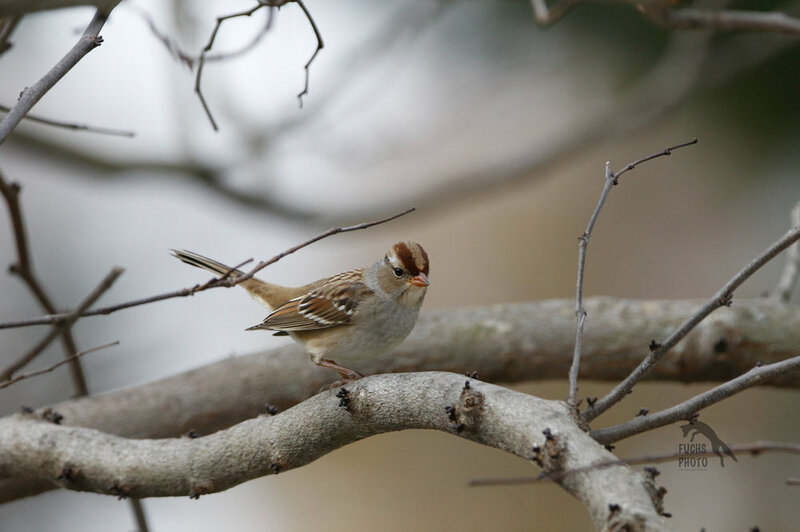 According to the American Museum of Natural History field guid, this could be an immature White-Crowned Sparrow, but according to Peterson's it could also be an adult Field Sparrow. Which is it? Seen on November 14th in central Virginia. Thanks for the help! This is a White-Crowned. the face is quite incorrect for a Field (no complete eye ring, there's a black eye stripe, which is wrong, the crown is divided and too prominent, the face not gray enough). The breast is also faintly streaked, the wing bars are quite distinct and the back doesn't seem to be rufous enough. All that said, this is a beautiful shot in what seem to be rather low light. Well done! Appreciate the quick response! Also thanks for pointing out the distinguishing features. I'm still in the early phases of birding, so that helps a lot!